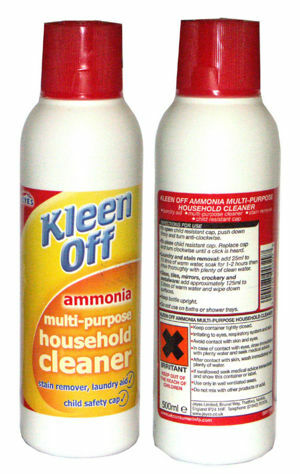 Kleen Off is made by Jeyes Ltd in Norfolk, England. It is a simple ammonia solution in a 500ml plastic bottle. More usually sold as a powerful cleaner it is ~10-35% Ammonium Hydroxide (NH3), that is ammonia in water. You can find in online by searching for "Jeyes Kleen Off Ammonia Multi-Purpose Household Cleaner"
5 drops of this liquid into 10 Litres (2.6US G.) of water will give you ~1ppm TA total ammonia reading. Used in the method of fishless cycling of new aquariums.